I’ve got another Halloween themed collection to review for you guys! 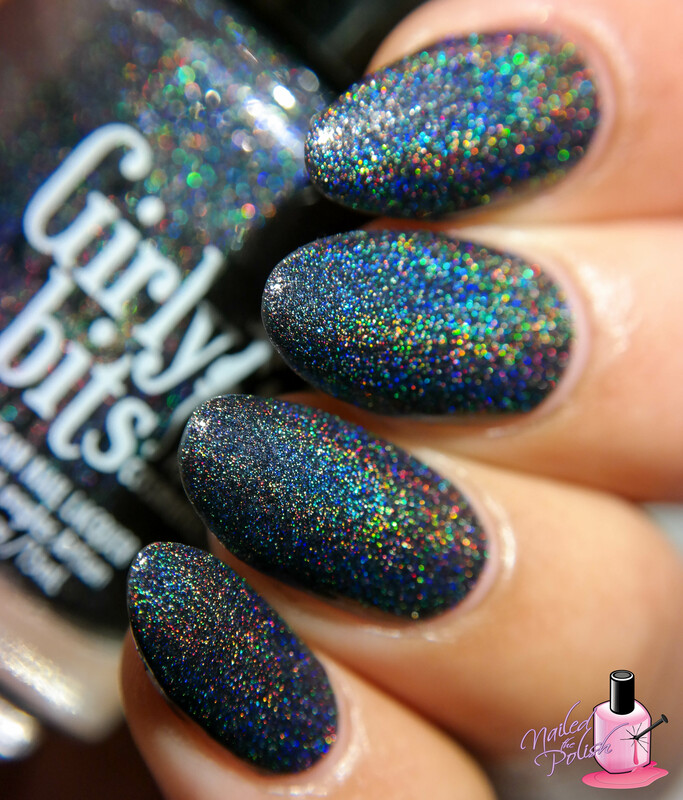 This time it’s from Girly Bits Cosmetics! This collection consists of seven polishes – two cremes, two shimmers, two holographics, and one glitter/flake topper that can also be worn on its own – that release today, October 19th, at 12pm (noon) EST. Goodbye-bye is a dusty army green creme. Shown here is ONE coat plus top coat. This formula is absolutely fantastic! I could not believe my eyes – It’s so smooth, so creamy, so wonderful! This polish is a perfect addition to any nail polish collection. Yabos is a smoky purple creme. Shown here is two coats plus top coat. This polish is slightly more gray than my swatch photo shows. Another awesome formula! Super easy to apply with great leveling and dry time. Girly Bits is killing it with these cremes. I am obsessed! Dead Man’s Toe is an army green crelly (same shade as Goodbye-bye) with pink to gold shimmer. Shown here is two coats plus top coat. Formula is… you guessed it… perfect! While the shimmer is at times subtle, it’s more noticeable in person than my photos show. The pink to gold shimmer gives this polish an added girly touch. The pink/gold shimmer compliments the army green so well! I am Calm!! 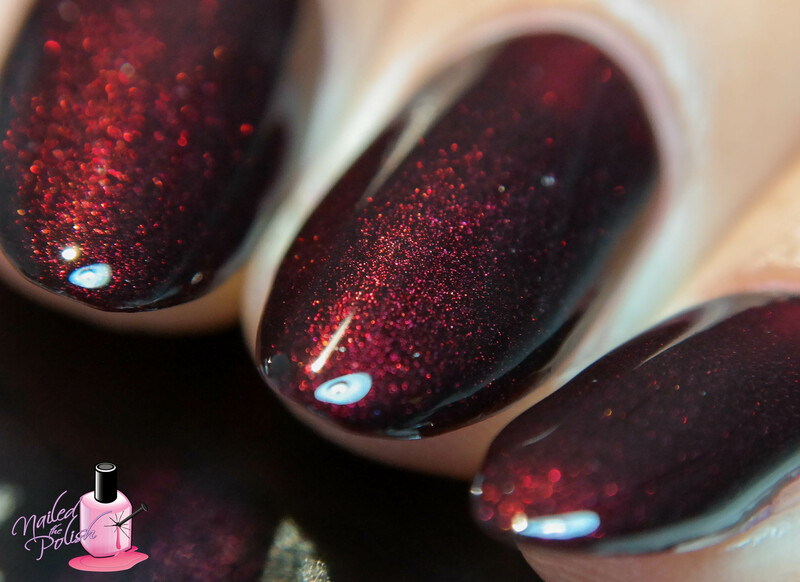 is a deep wine red jelly with fine red and gold shimmer. Shown here is two coats plus top coat. I am such a sucker for vampy shades and this one is no exception! The red and gold shimmer gives this polish a glow that is to die for. This polish is absolutely spectacular and I want to wear it all the time! Just look at those gorgeous violet flakes! Even under daylight bulbs, you can still see the holo! Amok! Amok! Amok! is a amethyst ultra holo with a slight blue to purple shift. Shown here is two coats plus top coat. Another stunner! 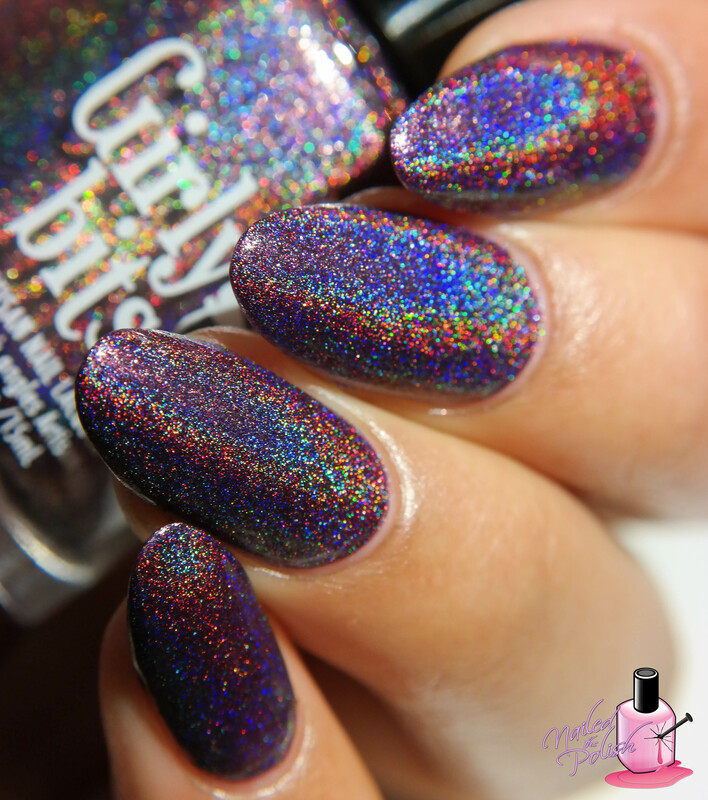 The holo in this polish is so strong that it makes my heart skip two beats! The formula is fantastic (just like all the others!) and well… you just need this in your life. 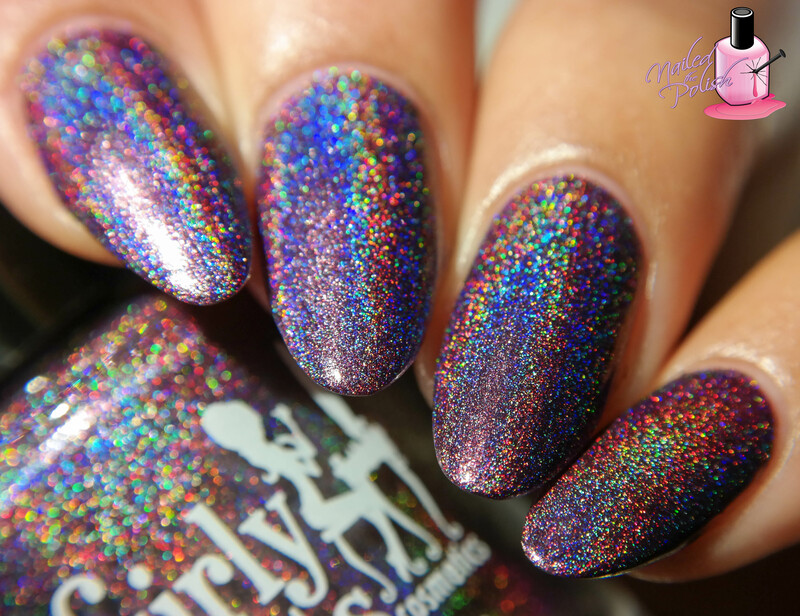 That holo! That blue/purple shift! That… everything! If that’s not ultra holo, then I don’t know what is! Last up is Witch, I’m Fabulous! – a clear base multichrome flake topper that shifts through pink, purple, gold, and blue with added chartreuse, purple, and gold holo microglitters plus gold and violet shimmer. Shown here is two coats over Amok! Amok! Amok! plus top coat. This polish could not have been named any better because it is FABULOUS! It’s like a concoction of all things magical from the nail polish world. With all these elements, you’d think this polish would be as thick as molasses but it’s not! It’s very easy to work with and levels exceptionally well. I cannot get enough of this polish! I don’t know what kind of nail polish making witchcraft is going on in Canada but sign me up! Girly Bits has killed it with this collection! I am so blown away with each polish that I’m sitting here at 4:00 am writing about them lol. Formulas are flawless. Consistency, application, control, dry time, leveling – all top notch! You can’t go wrong with any polish in this collection. Seriously! They are AMAZING. This collection releases today at 12pm (noon) PST and will be available for purchase here. Individual polishes will range from $12.00 to $14.00 CAD ($9.26 – $10.80 USD) with the entire collection being priced at $91.00 CAD ($70.21 USD). For a limited time, you can save $1.00 CAD off each bottle for a limited time by purchasing the entire collection for $84.00 CAD ($65.06 USD) which includes free shipping within North America. World-wide shipping is available with rates varying depending on destination. International orders over $80 will receive a $12 shipping refund, when the order is processed for shipping. For more information, check out Girly Bits Cosmetics on Facebook and Instagram!